The home design is not only monopolized by architects just because the house is a basic necessity for everyone. Therefore do not be surprised if everyone basically has the sense to make the home design. In designing of a house we can put all the things we want and we think in it like a den, family room, swimming pool, home theater, minibar, and others. You could be designing a minimalist style with the most modern technology, or a classic style with intricate carving detail. But if the problem of air and lighting systems are not processed properly, the house will not work optimally because both of these things are very vital. Air system that must be considered is the natural air. Indeed, many homes that use artificial ventilation via air conditioner (ac) due to erratic weather conditions at this time, but still natural air system ideally should be created. Natural air system is possible if there is a smooth air circulation in a room, so that there should be a smooth airflow pathway (inlet) and an exit (outlet) to pass air. This will make the air temperature in the chamber is maintained freshness. Pathways in and out of the openings embodied in such doors, windows and vents. 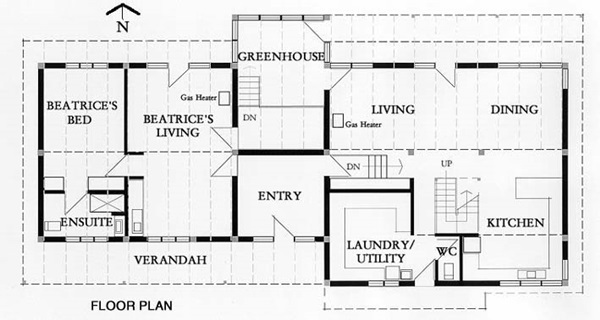 Designing a space with good natural air system starts with the preparation of the plan. All rooms should have air openings to the outside to get natural air. Bedroom is very important for the room in order to keep it fresh and healthy for the bedroom should be on the edge of the building or adjacent to open space that could drain the fresh air. Whereas for the kitchen, good air circulation is necessary for safety, health, avoid leaking gas hazards, etc. For toilet, so that the room was not hot and stuffy air and experiencing rapid change when it is used. Then there is an important point to support the freshness of indoor vegetation. The existence of plants around the house will provide abundant oxygen supply during the day, so even though the air during the day is hot-hot, more areas of your home is cool compared to the arid house without plants. As well as natural ventilation, natural lighting is also an important point that must be considered to obtain a healthy occupancy. Good lighting design process is usually coupled with ventilation design process, taking advantage of openings such as doors, windows, and vents to catch the light from outside. All of it starts from 2-dimensional treatment plan. but because of the lighting design relates to visual aesthetics, there are several other parameters that also said by architects such as creating transparent walls, wall grilles to capture light with a certain shape and intensity, the game reflected light indirectly, and others. So, always pay attention to these two important things in making design of a house, natural air and natural lighting. I completely agree with the lighting and natural ventilation. Having a proper lighting and ventilation in a home is essential. Lighting brightens our kitchen, our rooms and all the other areas of the house. Fresh air is important as it brings good health to everyone living in the house that’s why it is important to have proper ventilation as well.